Even though this article seems specific to a church/ministry organization, I have struggled with this at work. Especially when I am in the office alone, working through lunch, and a female co-worker decides to eat her lunch at work and wants to talk. There is a fine line between being professional and alienation. It’s important—especially as seemingly more and more Christian leaders are caught in a scandal—to make sure the right boundaries are in place to protect your marriage, your ministry, and your soul. But in doing so, it’s easy to put up so many boundaries you alienate yourself or stifle the giftedness and friendship of the opposite gender. Got up and went to the dentist this morning. Have had a tooth that has been bothering me that I wanted to get checked out. Turns out there was nothing wrong with the tooth in question. The dentist did tell me to quit clenching my teeth down, while at work, and that I should check into consulting an orthodontist. I then told the dentist that it was all my parents fault. That they should have paid for me to have braces. Of course I was joking, not sure the dentist took it that way. Had to explain myself. Oh well. Sitting here listening to the rain hit the windows. Kind of a dreary day outside. Has rained non-stop. Wouldn’t surprise me if we have gotten 3-4 inches by the time this storm system has blown through. Work has been slow lately. We currently have a bunch of projects on the horizon (April/May-ish) but a lot of prep work in the meantime. Trying to busy myself with lower tier office items that I neglect when we are running in full swing. Not a bad day over all. How are things with you? Every story has to have an inciting incident. A moment that propels the protagonist to respond with action. No matter the greatness of the action however, forward motion is key. 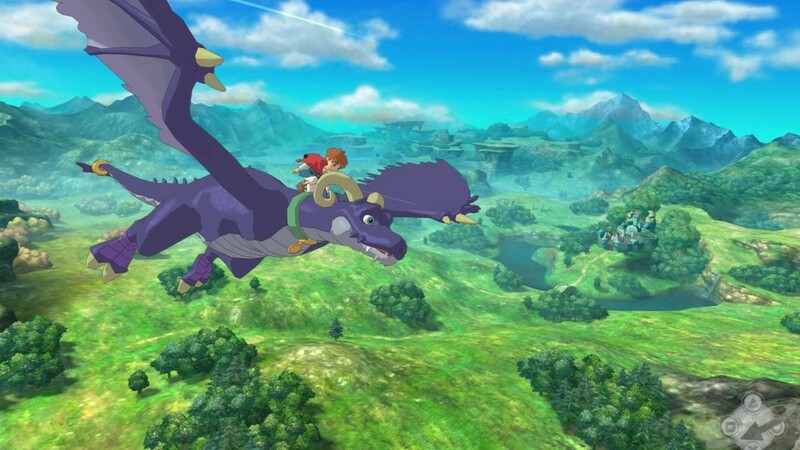 Ni no Kuni: Wrath of the White Witch opens in an idyllic American town. Seemingly breathed to life out of a Norman Rockwell painting, Motorville is sweet Americana. 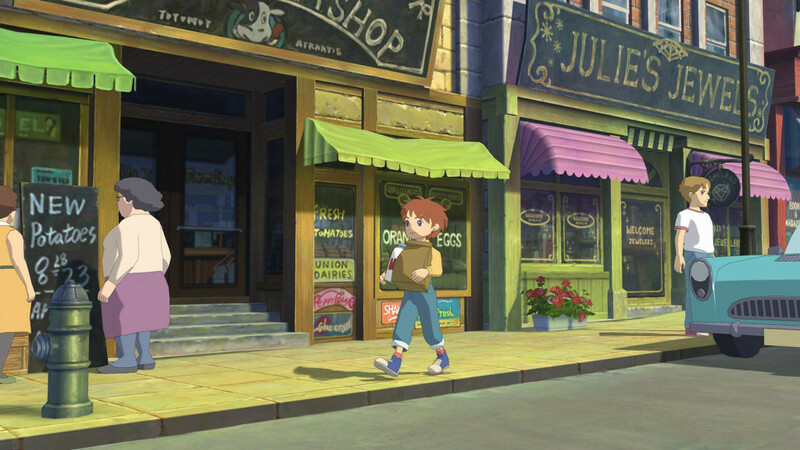 The game opens with Oliver, Ni no Kuni’s protagonist, dwelling in this perfection with his mother, Allie. As in many stories branded with Walt Disney’s name, Oliver’s father is no where to be found. Living in a town called Motorville, one would think there would be into a thriving automotive culture. Something akin to the car culture of Southern California. Well, one would be right in their thinking. Oliver’s friend, Phil, is a tinker who has built his own race car. After showing the car to Oliver, Phil asks him to sneak out, later that night, and come for a test drive. So, Oliver waits until his Mom is asleep and then quietly tip toes out of the house. A decision has been made, the adventure has begun. Outside of town, Oliver gets behind the wheel of Phil’s race car. Goggles in place, Oliver races the car down a road that runs alongside a river. Meanwhile, in another realm, the White Witch zaps Oliver’s car which causes one of the wheels to come off. He quickly loses control and swerves into the river. Drowning, Oliver gasps for air. The situation looks dire until his Mom shows up and saves him. Carrying him out of the river, she places him on the road above. Due to a weak heart, she then collapses and dies. Oliver is now alone. 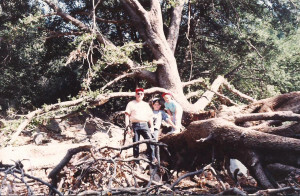 Grandpa Ayers, my brother and I at Mount Palomar, CA. My own father–or Dad, as I like to call him–drives a big rig for a living. This means that he is home maybe 2-3 days a week, depending on the week. With my Dad rolling down the highways, I was left with a lack of a strong male role model growing up. Thankfully, God filled that void in the form of my Grandpa Ayers. However, like Oliver’s Mom, my Grandpa was taken from me suddenly. I wasn’t alone, but I felt that way. My Grandpa’s death led me to a series of events that catapulted me into the lands of East Texas; his death was my inciting incident. Mr. Drippy comes to life! A funeral comes and goes, the game shows Oliver in his room crying. His family is no longer a party of two. Crying begets tears, one of the tears falls upon a stuffed animal Oliver’s Mom made for him. Mr. Drippy is this odd creatures name. Suddenly, he comes to life! Mr. Drippy, Lord High Lord of the Faeries, invites Oliver on a quest to save his Mom. A decision must be made…and Oliver decides he has nothing to lose. 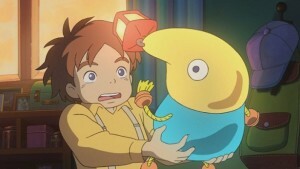 Following Mr. Drippy into the Ni no Kuni world, Oliver has a mom to save…or does he? Everyone has to travel in style, right? As a Christian, I am a citizen of Heaven. I know that Jesus defeated death by dying on the cross. I know that my Grandpa Ayers is in Heaven and that one day I will see him again. I know that I do not have to embark on some epic quest with the Lord High Lord of the Faeries. The Lord calls me to go, tell others about him, and help train up Christian brothers along the way. Death has no power over me; death is simply an Earthly signal that I have gone on to work and serve my God. I can’t wait.